This is one of those rare times where I saw something on Pinterest, was inspired, and ACTUALLY DID IT. Seriously folks, mark this day down or something. So here's the story. 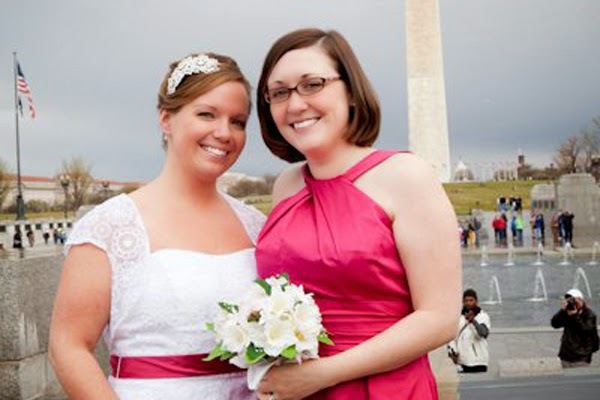 My best friend, Mary (who also happens to blog! ), is pregnant with her second little one. Her first, Parker just turned two this summer and will be getting a little sister in just a few weeks! For Parker's shower, I put together a neat basket of all of the medication, first aid, and health things that Mary and Rob would need for Parker's first year or two. Being second time parents, however, they've got all of that under control this time around. I really wanted to find something special for baby girl; something they didn't already have. In comes Pinterest. I saw a pin about turning a bridesmaid dress into a baby blanket for the bride when they had their first child. That's cool and all, but babies end up with A LOT of blankets and most of them sit in a drawer. What else could I do? When I was in 2nd grade and did my First Holy Communion, my Aunt Pat made me a beautiful stuffed bunny with an eyelet dress and pearls - all dressed up like my Communion dress. I loved it! I recently got that bunny back from my Dad's house and it all clicked; turn the bridesmaid dress from Mary and Rob's wedding into a doll. I'll be honest, I loved this dress and thought it was completely a "you could wear this again!" sort of deal. The problem is that I live in an apartment, am therefore limited on space, and had nowhere to wear it again in the foreseeable future. It will live a much more productive life as a bunny, trust me. Excuse the wrinkles; it has been in my closet for a few years! I broke out my Ginghers and seam ripper and went to town. Within the first 30 seconds I realized that this dress was made much, much better than I had anticipated. It took a LOT of seam ripping, tearing, and cutting. When all was said and done, I had a nice little pile of fabric to work with. 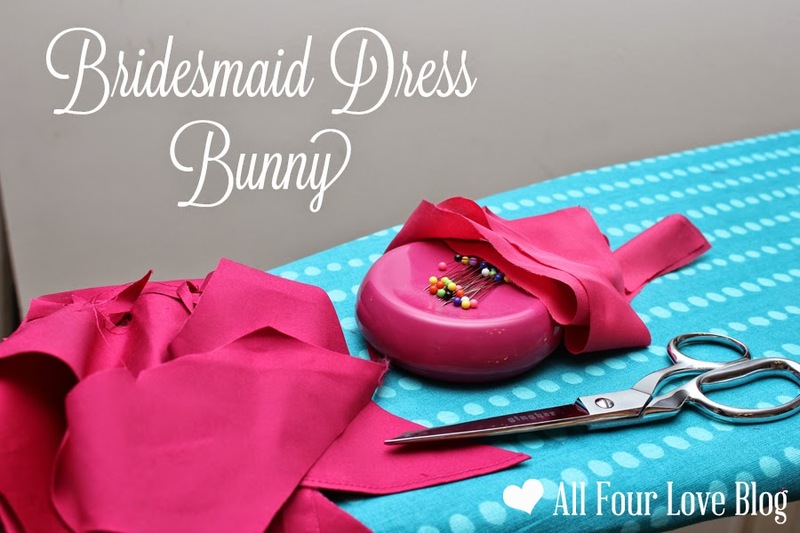 Being a shorter dress, I could only hope it was enough to fit the bunny pattern. It ended up being just perfect, with some pieces left over. I used the dress lining as the lining to the bunny ears since it was a slightly different shade and texture. With no filling, the ears were nice and floppy - perfect for a bunny! For this project, I ended up buying a Simplicity pattern (#9524) on sale at JoAnn's after searching the internet for a free one. It ended up being a super simple pattern with a lot less pieces than I was anticipating. Coupled with locking eye and nose pieces for safety, the bunny came together in under 2 hours. I am so happy with this sweet pink bunny. I've had it made for a few weeks now, just waiting for our next visit so I can give it to Mary. Thankfully, we got together this weekend, so I can finally post about it! Plus, my kids can stop asking me if its for them as it sits on the bookshelf. Guess I'm making some stuffies for Ginny and Charlie next! What a lovely heirloom for baby girl! And what a sweet and thoughtful gift for you to make- from your heart and hands!